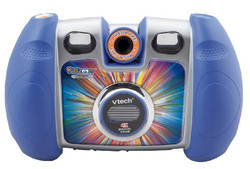 The Kidizoom Twist Camera from VTech is a 2 megapixel camera with everything kids need to take great pictures, all in a super-tough casing that's easy for little hands to hold. Kids can take pictures and movies of their friends, then simply twist the lens around to take pictures of themselves! Or, they can record their voice and add special effects including pitch shift up, pitch shift down, slow down, robot and echo. With a 4x zoom, built-in flash, dual view finders, and a colour screen, plus a SD slot for extra storage, the Kidizoom Twist is a high tech digital camera and fun at the same time. Kids can see their photos on screen, on on a TV or PC with the supplied connection cable, and have fun with the special editing software to add funky frames, wacky effects or stamps. And as if this wasn't enough, the Kidizoom Twist comes with five built-in games as well! special twist lens for self-portraits! Like this top Christmas toy, but not quite right? How about a VTech InnoPad instead?